I nearly missed the correct date for Duan Wu Jet 端午節. I knew it's the 16th but my silly head keep thinking it's Thursday instead of Wednesday today. I made another batch of zhongzi last night, this time is savoury with ground roasted peanuts and pork only, flavoured heavily with five spice. I think this is Hakka style zhongzi, we used to buy these at the market all year round when I was still living in the Far East. Here is the recipe, I have included a far more detailed slideshow if anyone like to know how I wrap these dumplings. See also previous posts for lye zhongzi and the another for a meaty savoury one I posted last year. 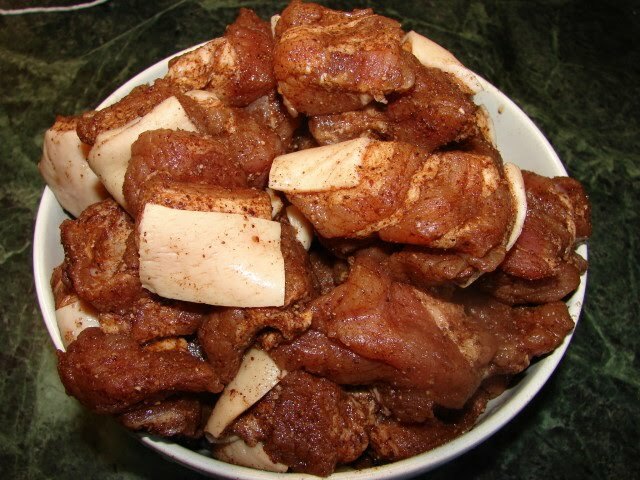 1 or 2 days before making the dumplings, prepare the pork. Cut pork into chunks and marinate with salt and five five. Leave in the fridge till ready to use. Night before or at least 5 hours before wrapping. 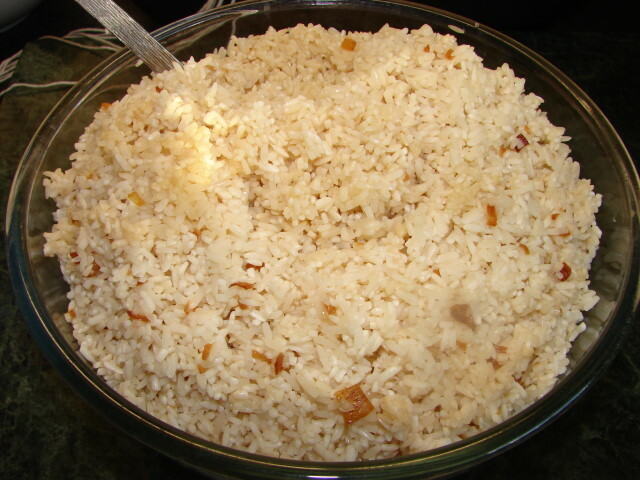 Rinse and soak the rice. Drain with a sieve, shake off as much excess water as you can. Set aside. Chop some garlic (about 2 cloves) and 1 shallot, fry with few tbsp oil on medium heat till golden but not burnt. Take about 2 - 3 tbsp of this fragrant oil, 2 tbsp light soy and 1 tsp salt, mix this thoroughly with the rice. Set aside till ready to use. Night before or few hours before wrapping, soak the leaves in water till softened. Then blanched in boiling water for 8 - 10 minutes. Take them out and rinse with cold tap water. Then soak with fresh water till ready to use. 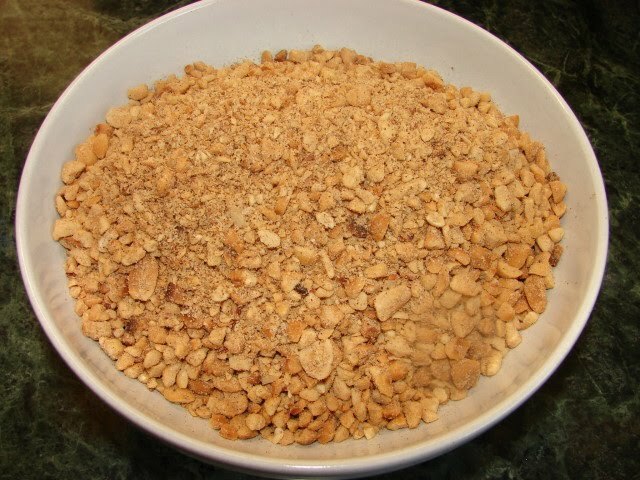 Roast the peanuts using a dry wok, at low heat, stirring most of time till golden brown. when cooled, remove husk or skin, by rubbing the peanuts inside a colander, shake off or blow away the skin (best do this in the garden to avoid mess). When done, chopped or ground the peanuts in a food processor. If you can't be bothered with roasting you own peanuts, you can use ready to eat shop bought roasted peanuts. When the peanuts are chopped or ground, mix with some five spice and salt. Prepare the string for tying the dumplings. Each string is around 90 -100 cm long, tie in a bundle or 8 - 10 and tie the lot to a door handle or wall hook for easy tying. 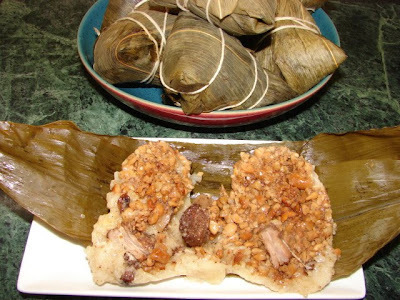 Detailed Slideshow how to wrap zhongzi. This is my method. There are other various ways to do it. Once all the dumplings are wrapped. Take one very large pot or 2 smauller pots, fill up to 3/4 full with water. Let water boil rapidly. Then put in the dumplings. Totally immersed them in water. Boil at high heat for about 10 minutes, then lower heat to low and boil for several hours. If each dumpling is less then 150g boil for 2 hours, for large dumplings 200g or over boil for 3 hours. Finally one small note about the bamboo leaves. 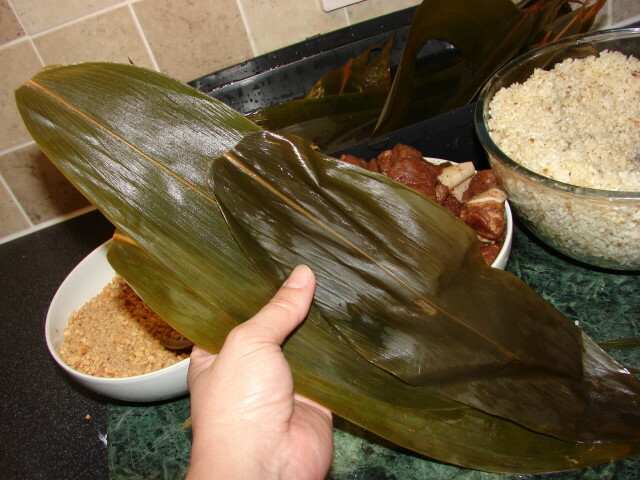 Best use leaves which are around 30cm or longer and wider the better, then 2 leaves are enough for one dumpling. If the leaves are short and thin, you may need to stack 3 leaves together like this. 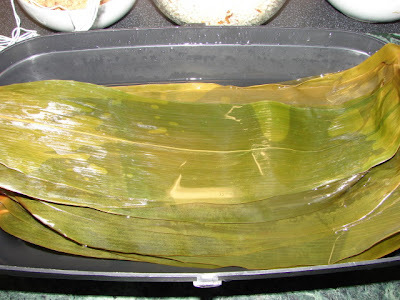 The minimum length of the stack together leaves is best at least 35 to 40 cm long, and the stack together width is around 10 - 12 cm wide, if not you may find it difficult to wrap and dumpling may leak, especially for bigger dumplings. I think different families put different fillings in their Joong. My mum makes savoury ones which are a treasure trove of meaty goodness! I must say that for my taste, roasted chopped peanuts are an absolute must (although my bro hates that!)! One of mum's fillings would include: home roast char sui, diced chicken, shi-take mushroom, lap cheong slices, (maybe chestnuts), dried shrimps, shallots, these are all sliced/diced, cooked together and is slighty saucy (thickened with cornflour) and used to wrap into plain glutinous rice 'pillow-shaped' joong. They are delicious! I've only made the triangular shaped ones and my filling ingredients aren't as long! as mum's! There are so many different types of filling. My mum made some with pork coated with curry powder and added aduki beans (red beans) to the rice. I love your pictorial step-by-step instuctions for wrapping! Sadly, when I tried wrapping these with my 80-year old grandmother, she just shook her hand that I can't wrap nor tie the zhongzi properly! Ah, it'll be lost art in my family, but with your step-by-step pics, I might try again...just gotta work on the tying the zhongzi tight! Hope my picture guide helps. To practice try wrapping without filling just rice to avoid spoilage and waste. If fail can undo and try again. 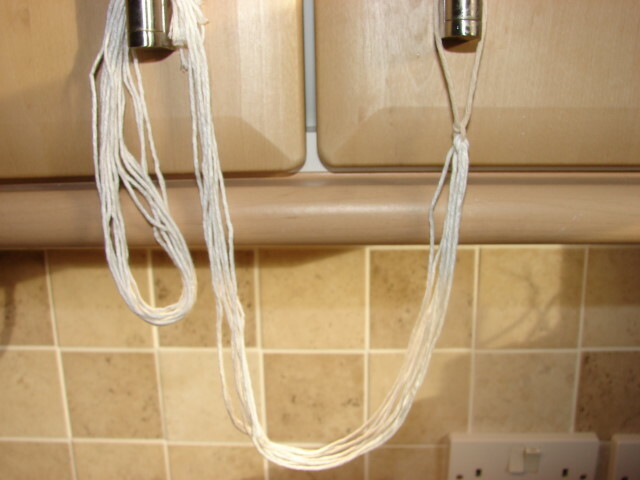 When you tie with string not extremely tight or the rice won't absorb enough water to cook and lead to rice hard or not easy to cook through.